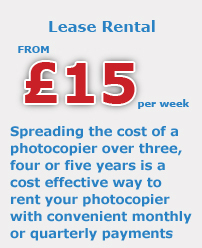 Teffont offers fantastic deals on Ricoh Aficio, Konica Minolta bizhub and Muratec photocopiers. Whatever your requirement, be it a desktop copier or a large multifunctional colour copier we can provide you with the most cost effective purchase options available. We offer a free no obligation advice and quotation service that gives you the time to choose the right machine for your needs and at the best possible price. Nearly all copiers are now capable of copying, printing, faxing and scanning; providing incredible value for money when compared with separate devices. Desktop Photocopiers: Smaller in size than the free standing models, a desktop copier sits on a table without the need for a stand. 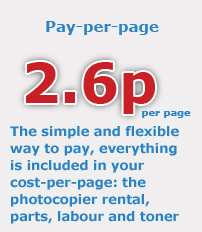 It is ideal for small to medium sized businesses, with a low monthly copy volume. Mono Office Photocopiers: Mono copiers print documents in black and white and have a relatively fast page per minute speed. They are among the most cost effective in terms of purchase and offer cheaper running costs. Mono copiers are available to suit office output, from low to high volume. 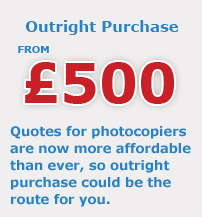 Colour Photocopiers: Colour copiers are becoming more and more popular in business. Many colour copiers are colour capable or hybrid, which means that they can alternate between black and white printing and colour printing, alleviating any concerns about colour being used unnecessarily. Wide Format Photocopiers: Wide format copiers produce documents up to A1 in size and most support a range of architectural, construction and engineering applications. Mono wide format copiers are invariably used for technical drawings and documents, while colour wide format copiers are often used in graphic design to produce posters, photographs and signs. Production Photocopiers: Production copiers are for businesses with high volume usage, producing excellent quality prints at high speed. Most production photocopiers are accessorised with a variety of finishing options such as automatic comb-binders and hole-punching. Ricoh Aficio Photocopiers: Ricoh is the world’s leading manufacturer of photocopiers. With a vast range of models, from all-in-one desktop copiers to top of the range multi function models, Ricoh copiers are among the most reliable on the market. Konica Minolta bizhub Photocopiers: Konica Minolta produces one the most highly respected ranges of colour multifunctional copiers, ranging from compact office models to high production systems for major organisations. Muratec Multifunction Photocopiers: Muratec manufactures the industry’s most affordable range of multifunctional copiers that incorporate scanning, faxing, and printing as standard across most models. They are well suited to small businesses and low volume users.